Only a handful of people still remember Sarah Schenirer, a pioneer of girls' Jewish education who, combining tradition and modernity, single-handedly saved generations of ultra-Orthodox women from alienation and secularism. It begins with a seamstress in Krakow at the turn of the century. A young woman, her mind as nimble with Hebrew texts as her fingers with the needle. The Jewish wives and daughters who enter her shop for fitting turn to her for advice, chatter about fashions, silhouettes, their never-adequatefigures; the seamstress kneels quietly, stretching her measuring tape, pinning a fold, securing a hem. A young Sarah Schenirer, daughter of a prominent Belzer and Sanz Hasidic family, had attended public school in Poland, while studying Hebrew texts on the Sabbath, relying on Yiddish translations of biblical commentaries that her father had given her. “And as we pass through the days before the High Holy Days...fathers and sons travel, and thus they are drawn to Ger, to Belz, to Alexander, to Bobov, to all those places that had been made citadels of conceited religious life, dominated by the figure of the rebbe’s personality. Schenirer occasionally attended lectures at local universities, where many young Jews gathered; but after joining a meeting of the Jewish youth organization called Ruth, and seeing its young members lighting candles on the Sabbath, Schenirer was upset to see the girls’ ignorance of the traditions. She decided to devote herself to girls’ education after attending a Sabbath lecture of Rabbi Dr. Flesch, in Vienna, during World War I. Inspired by the rabbi’s Hanukah-themed sermon about the Apocryphal heroine Judith, and the power of Jewish women to continue her legacy, Schenirer began attending Flesch’s lectures regularly, studying Torah through the lens of Rabbi Samson Raphael Hirsch, the neo-Orthodox rabbi of Frankfurt. At the end of the war, Schenirer returned to Krakow with her family, armed with both a German Jewish education and a Hasidic fervor for setting up a new movement: a school for young Jewish girls. 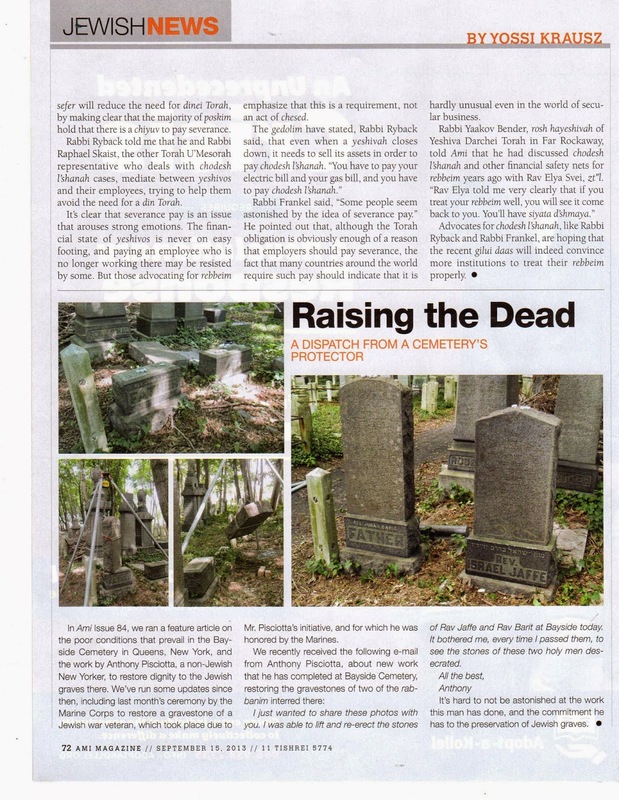 Her brother, a prominent member of the Belzer Hasidic community, tried to discourage her, insisting that her chances were slim, but finally agreed to take her to meet with the Belzer Rebbe in Marienbad, today in the Czech Republic. Upon hearing Schenirer’s idea of a school, the old rabbi offered her two words: “Mazel ubrocha”. And thus, with the blessing of the Belzer Rebbe and eventually others - including, perhaps most famously, that of the Chofetz Chaim, Rav Yisrael Meir Kagan of Radin - Schenirer set out to found her school. She first began with young women, but saw that her efforts were fruitless: They were too mature, too distant and uninterested in studying traditional religious observance. So she turned to the younger set, and in 1918, she gathered seven young pupils in a rented room in Krakow. The lessons in that cramped room - featuring a Lithuanian-style of studying Hebrew texts coupled with a Hasidic emphasis on character development - were wildly successful. Within five years, Schenirer’s seven students had grown to seven entire schools, numbering 1,040 students. And a mere 10 years later, in 1933, there were 265 schools in Poland alone - for almost 38,000 students. Schenirer’s idea had taken Jewish Europe by storm and evolved into the Bais Yaakov movement, named after a biblical verse referring to Israelite women. Schenirer’s teachers were graduates of her own schools, trained by a teachers’ seminary that Schenirer founded in 1923, and taught by Agudath Israel’s Dr. Leo Deutschlander. By the eve of World War II, Bais Yaakov had grown into a diverse movement of its own with a large administrative board (in which Schenirer chose to not be involved); some schools offered Polish and German literature, pedagogy and psychology in addition to Jewish courses, while others taught agriculture to young religious Zionist women who planned to move to Palestine. Throughout Eastern Europe, youth groups, summer seminars and camps had cropped up, with Schenirer’s presence, her charisma and conviction remaining at the center of the movement long after her death in 1935. She married late in life and died childless, though the thousands of women who had studied in her schools would later speak of themselves as her children, the adopted daughters of Frau Schenirer. Of course, a century later in Orthodox girls’ schools, no one taught us about Schenirer’s secular studies. Nor did anyone tell us about the testimonies that those who knew her have given since, stories which would fit all too awkwardly into a hagiography: that she had been married previously at an early age but soon afterwards got divorced (some say her husband was not religious enough for her, others claim it was childlessness which drove them apart), that she studied the Mishna in the original Hebrew without Yiddish translation, that her lectures were attended both by men and women. After Schenirer’s death, religious leaders went to great lengths to describe Schenirer as a "modest, pious woman." As Shoshanah Bechhofer writes in her 2005 dissertation on the subject, a “movement that represents change [in] a religious community that reveres tradition” must “celebrate its innovator without celebrating the idea of innovation”. And so, it was decided that, if ambition contradicts the traditional ideal of female piety, Sarah Schenirer’s memory would have to evolve first and foremost as a paragonof modesty, a modern-day redeemer of the daughters of Israel. And so, she has become today exactly what she once mourned in her diary: a woman wrapped in shawls rather than words, a perfectionist in “clothing the body” but not so much in clothing the seeds of the soul - or the mind, for that matter. Perhaps what’s most radical – and also, sadly, most overlooked – about Schenirer’s memory is her diplomatic talent, a subtly dimensional way of thinking which drew on both the cold precision of a Viennese seamstress and the heated passion of a Krakow Hasid. A woman who proved that ambition and modesty needn’t be mutually exclusive - that serious piety and serious education might both have a place, if one only has the intellectual capacity to allow for both. Utterly unapologetic about tradition and modernity, Schenirer can serve as an unlikely symbol of women’s empowerment, accomplishing the unimaginable in securing major Haredi leaders’ approval to forever change Orthodoxy, within halakha. Instead of attempting to shatter an entire, and immersive, legal and social system, Schenirer worked within the structure of Torah and social conventions, becoming a quiet emblem of powerful influence - not through a revolution in the streets, nor through unseemly opposition rallies. Rather than wielding a saber or picket, Schenirer held a schoolbook. What's new at the Institute? 1. The Talmud Yerushalmi Institute is proud to announce the launch of its Talmud Yerushalmi Daf Yomi Resource. The Resource has gained immediate interest and already can be found on the Orthodox Union's Daf Yomi site which has 1,800 regular listeners. (www.ou.org) Starting from Masekheth Shekalim we anticipate that our banner will appear at the top of the page in the most prominent location. The Talmud Yerushalmi Daf Yomi Resource provides a value added for the Talmud Bavli Daf Yomi. It will allow you to walk away with a short but powerful insight from the Talmud Yerushalmi or the Teachings of the Land of Israel when you study the Bavli Daf Yomi allowing you to compliment or conceptualize your learning. Stay tuned for notifications about other Daf Yomi Resources linking into us. The Talmud Yerushalmi Institute wishes to thank Rabbi Yisroel Belsky and Rabbi Y.G. Bechhofer for gradually reviewing the materials that we are posting. 2. The Talmud Yerushalmi Institute wishes to welcome Rabbi Moshe Baredes, a distinguished rabbinic author and scholar to our team. Rabbi Baredes has embarked on the study of Rambam's method of ruling from the Talmud Yerushalmi which has not been studied systematically, but is absolutely critical to Pesak Halakhah in contemporary and classic issues. Being that Rambam is one of our most prominent Posekim and at the same time one of the Talmud Yerushalmi's biggest proponents in our Tradition of Pesak Halakhah, the value and importance of this study does not need to be stressed. In this study Rabbi Baredes will also attempt to reconstruct some of Rambam's theory of the Talmud Yerushalmi's redaction and composition. The beginnings of his studies are posted on our website in the Redaction Section. 3. The Talmud Yerushalmi Institute welcomes Rabbi Shimshon Nadel of the Holy City of Yerushalayim who runs the Har Nof Kollel. 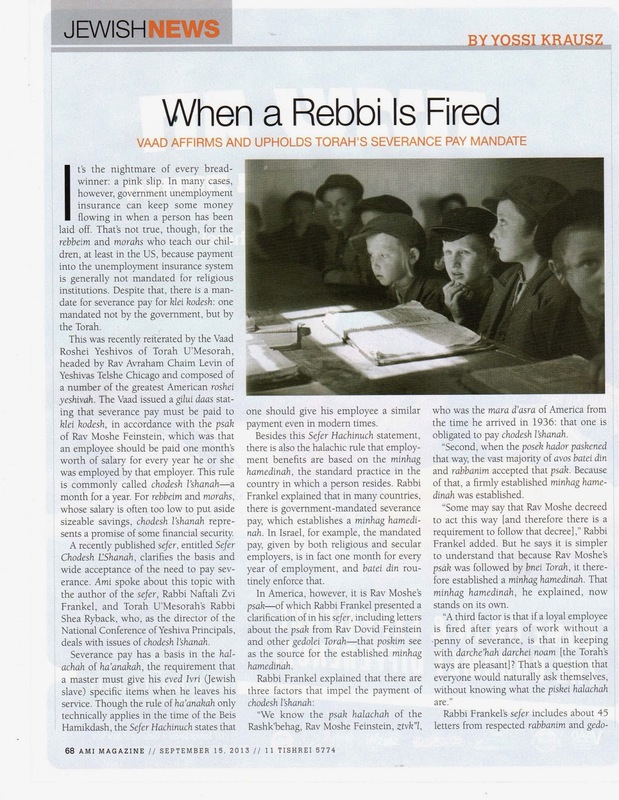 Rabbi Nadel holds an excellent track record at publishing articles in numerous magazines and journals of all levels of popularity, both in English and in Hebrew. He has lectured before a broad spectrum of audiences, popular to Academic. 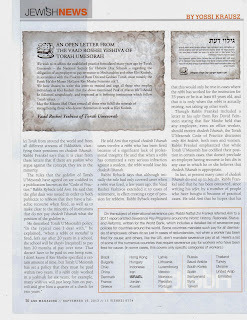 As part of our effort at raising awareness and arguing the case for the Talmud Yerushalmi and the Teachings of the Land of Israel, the Institute is embarking on a program aimed towards the tens of thousands of semi-scholarly readers via the well established traditional paper and digital media. 4. The Talmud Yerushalmi Institute welcomes the release of our Modern Elucidated Talmud for maskekheth shekalim in time for the Daf Yomi Cycle. 4. The Talmud Yerushalmi Institute wishes to thank The Foundation Stone for providing us with a unique forum for bringing our more popular materials before an additional 4,000 viewers per month. 6. The Talmud Yerushalmi Institute wishes to thank Rabbi Yisroel Belsky and Rabbi Y.G. Bechhofer for gradually reviewing the materials that we are posting. 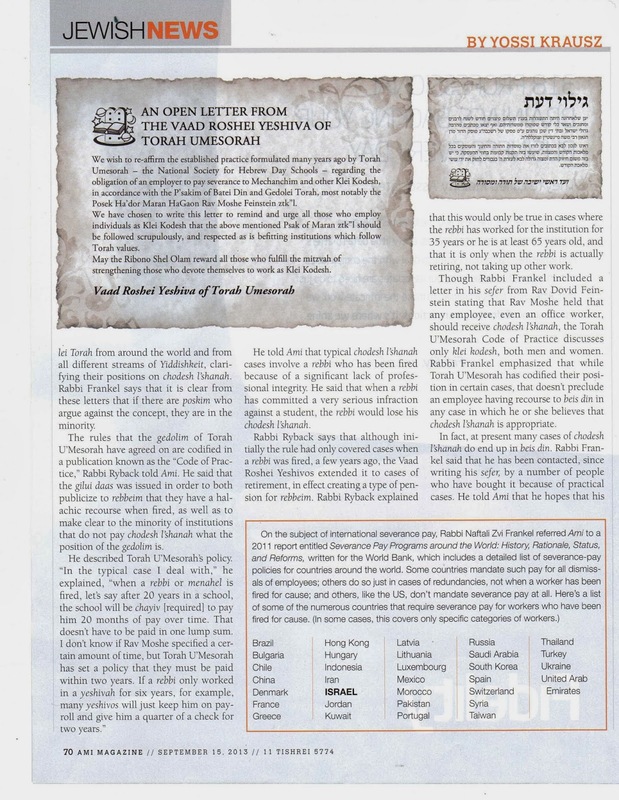 If you would like to purchase an Artscroll Talmud Yerushalmi at 30 Percent of list price, the Shas foundation funded by Asher David Milstein would like to help. Please email emunk@torahlinks.org with your request. 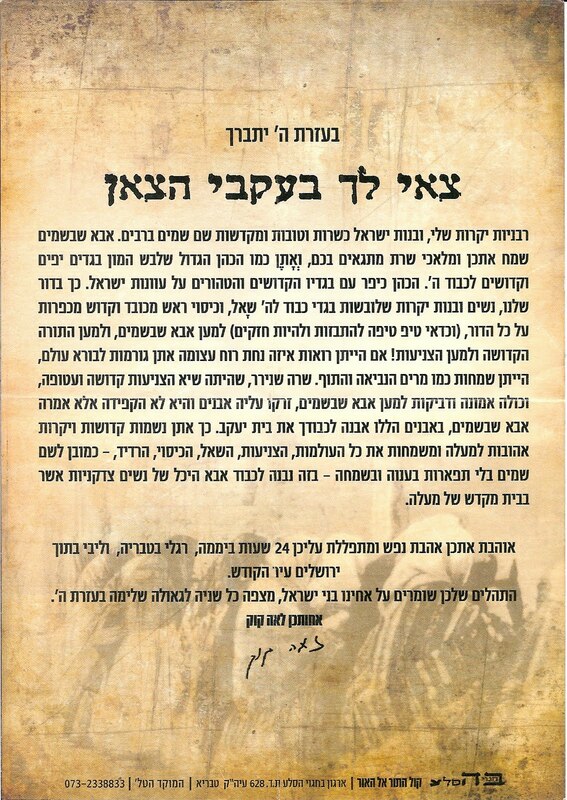 I have been asked by Jewish Action to write an essay on psakim of ROY zt"l similar to the one I wrote on RYSE zt"l. Od chazon la'mo'ed. In the meantime it is very important to understand the phenomenon of the levaya and what it means about the blurry divisions among Edot HaMizrach that we Ashkenazim can only note with envy. To understand the breadth of the bonds, it is worthwhile to watch this video about ROY and his grandson. Today there are two choices basically, Haredi and MO. I can't expect a BT to become purist TIDE when there's no pure TIDE community to go with it. I do TIDE in my house, as best I can concoct it on my own. It's lonely but I can go a long way with books. Most people want more than that. I have to offer them what's out there. All groups are flawed today. But that's what we have. To me they are equally flawed, no one group more than any other. Each magnifies the flaws of the others and minimizes its own of course. That's part of the flaw. The Litvacks are gone. TIDE is gone. Straight up Sephardic is gone. I'm talking about the communities. The philosophies are still there of course along with a handful of purist practitioners. But the philosophies have morphed into new flawed ones as far as communities go. Litvish into Haredi, TIDE into Modern. Old Chabad into new Chabad. Sephardic into all of the above. Actually it's a bit more complicated since Washington Heights went Haredi - or so I'm told - but TIDE influenced the yeshiva education program. Whatever the exact history of it, there's no pure TIDE community that I know of. People need community, particularly in this era where they are told sadly that conformity is a religious duty. If I got into that polemical condemnation game that many rabbis are so fond of, if I expected flawlessness from any group before presenting it as an option for newcomers, I'd have nothing to offer people. We could use a TIDE updated for the 21st century. But who is going to do that? That's what I try to offer my family. I do it like Avraham. Alone. That's why I think we need a virtual TIDE community. A place to discuss and apply the derech. And kids can say, I'm TIDE and there'd be some kind of identity and community, with occasional get-togethers, and maybe even a Rav, to go with it. As RAEK stated in admiration of Dr. Nathan Birnbaum, he - and, by association, many of the individuals currently inaccurately labeled "Ba'alei Teshuva" - are in reality Avraham Avinus. They perforce have come as thinking, courageous individuals to a recognition of the truth of authentic Judaism. And, like Dr. Birnbaum, they are inevitably dismayed to find that Orthodox Jewry does not reflect the pure and lofty truth and aunthenticity of Orthodox Judaism. The response to them - and to the like-minded seekers in the FFB camp - should not be to admit defeat and urge them to do so as well, to shunt them and to urge them to allow themselves to be shunted to philosophies and systems we believe flawed - not to mention unsatisfying - but to present the alternative of authenticity, as difficult and impractical as it may be - because, ultimately, Am Yisroel's entire essence is the preservation and manifestation of authenticity, as difficuly and impractical as it may be. RSRH and his successors were far more concerned with truth than with popularity or practucality. We who have been born in the latter part of the 20th century and beyond have been cursed to have been born into un-even anti-heroic times. It is hard to be a hero in a world that is, at best, dismissive of heroes and heroism. A world in which even idealists and idealism are rare commodities, indeed. But all the more reason that we should cultivate whatever sense of mission and quest we do possess, and represent and present TIDE without compromises that undermine its truth and its authenticity. Accordingly, to uncritically suggest resources that lack - or, worse - work against TIDE is expedient, short-term practicality, but in the long term a devastating dimunition. This should be mandatory watching for almost (see below) every human being alive today. But especially for almost all parents and children, mechanchim and talmidim. Note: See the comments for the criticisms which caused me to introduce the bold caveats above. This is a public television video, and it does contain a very brief display of a scantily clad female teenager (as part of a cautionary segment concerning what parents discover concerning their children's internet activity). If this scene is something that would prevent you from viewing a video, ashrecha! You are lucky to be part of the very small portion of today's society who may not be subject to most of the pitfalls that the overwhelming majority of even the most Orthodox Jewish society faces today.